This elegant island has to offer anything a visitor might dream of. Tourism at Mallorca started to develop already in the 1920s, and until the Spanish Civil War it was mainly intellectuals and artists who were attracted by this island. Mallorca's wonderful climate, beautiful landscapes as well as its cosmopolitan ambience make it a privileged holiday resort, with a cultural offer comparable to the one of many European capitals. The Auditiorio de Palma, for instance, ranks among Europe's top concert halls. At Mallorca, you will find relaxation, inspiration, culture and entertainment. The city's cultural offer is impressive, specially if you take its size into consideration, and there is a large number of monuments you really should not miss. Incensed by Balearic piracy, Rome sent an expedition led by the Roman consul Quintus Cecilius Metelus to teach the Islanders the error of their ways. Victory was followed by 3,000 colonists who spread through the Island or settled around the Almudaina - the first part of the city to be walled- and Pollentia in the north. The Palma-Pollentia road follows the ancient Roman way very closely, although the site of Tuccis, a staging post has still not been identified. With the arrival of the Christian religion, the first churches were built on the Island, although no remains have been found in Palma. At this time, Roman power had begun to wane and the Island was subject to raids by Vandals, Byzantines and Moors. Historically, very little is known about this period. Gundericus the Vandal sacked Palma but abandoned the town, which remained under Roman rule. Gensericus, brother and successor to Gundericus, conquered the Islands and persecuted the Christians. Hunneric, his son and successor called the bishops of Mallorca and Eivissa - Macarius and Helias - to Constantinople and asked them to recant. On their refusal they were exiled and persecution began again. Once again the poor rose up against the rich landlords in an uprising known as les germanies. This time the "agermanats"or peasants, seized and entered Palma, sacking the mansions of the rich, many of whom had fled to find refuge behind the walls of Alcϊdia in the north of the Island. Although the rebels were, in fact, loyal to Carlos I, he quite naturally supported his nobles and ordered reprisals. The leader, Joanot Colom, was tortured and beheaded and his head displayed at the gate close to the Santa Margalida Church. Birth of Catalina Tomαs Gallard in Valldemossa, the Island's only saint. Known as the beateta, she entered the Santa Magdalena Convent in Palma in 1555. She was credited with many miracles throughout her life, and after her death in 1574, the Islanders made her into a cult figure. The church disapproved and Pope Urban VIII forbade her worship in 1625. However, in 1792 she was beatified by Pope Pius VI and made a saint by Pope Pius XI in 1930. Her tomb is in the Santa Magdalena Convent Church, and her body is said to show no signs of decay. Her fiesta is celebrated on 28th July. Charles I of Spain, also known as Charles V the Holy Roman Emperor, accompanied by a huge retinue paid his second visit to Palma between 13th and 18th October, on his way to conquer Algeria. He was received with great pomp and splendour and several triumphal archers were erected in his honour. Work began on the last of the five walls protecting the city. However, escalating costs meant that it was not completed until 1801, only a few decades before the explosive growth of the city led to its being demolished. The Decreto de Nueva Planta of Felipe V. Ciutat de Mallorca readopts its Roman name of Palma, and power is now wielded from the Peninsular strips the ancient Kingdom of Mallorca of its privileges. Palma supported the anti-French uprising, refusing to acknowledge the governor sent to the Island by Napoleon. The Jews were accused of resorting to bribery to avoid enlistment in the army being raised to combat Napoleon. There was a new attack on the Call area. Demolition of the Inquisition Building located in what is, today, the Plana Major. This was one of the early results of the Desamortizaciσn de Mendizαbel, which dispossessed the religious Orders of their property. Growth inside the walled city and the prohibition on building within 1,250 metres of the walls led to the beginning of urban settlements outside the walls, such as El Molinar, els Hostalets, la Soledat. The stretch of wall between el Moll de la Riba and Las Drassanes was demolished. This was the beginning of a lengthy campaign to demolish them all. Inauguration of the Palma-Inca railway. Fire destroys the Palma Town Hall and only the facade and some works of art can be saved. An explosion in a military arsenal close to the present day Hacienda leaves a hundred dead. Demolition of the walls began on 8th August amid great rejoicing by the inhabitants of Palma who considered it and essential step towards modernisation and growth. After an army uprising on mainland Spain, the military commander of the Balearic Islands assumed power. It was the beginning of the Spanish Civil War in Mallorca. General Franco visited Mallorca when the remains of King Jaume I and King Jaume II were transferred to the Trinity Chapel in the Cathedral. The beginning of the tourist boom opened up the Island to the outside world and brought about a change in the hitherto very conservative outlook of the Mallorcans. The first democratic elections brought victory to the Socalist Party and Ramon Aguilσ was elected Mayor, a position that he held for twelve years. The Conservative Party wins the elections and Joan Fageda becomes Mayor, a position that he lost against Maria Antonia Munar who, on Friday 4 July 2003, was re-elected president of the Council of Majorca for the third consecutive term of office. Jaime Matas, the Balearic president attended the inauguration, which was conducted by ex-mayor Fageda. The message that Munar presented was that Mallorcan people have wanted to get home to the new government on the Islands. -That is to take maximum advantage of the fact that the party now in power in the Balearics is the same as that holding office in Spanish central government. But, of course, this was BEFORE the horrible attack against the trains in Madrid on March 11 2004 and the elections that soon followed that brought a dramatic change to the political map of Spain. 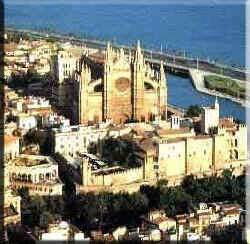 The Cathedral - This is, probably, the most distinctive landmark of Palma. The cathedral, called la Seo by the Mallorquines, was constructed from 14th to 19th century, and the highly creative Antoni Gaudí designed its interior in 20th century. Results are fascinating and original at the same time, almost impossible to describe with words. Most outstanding are perhaps the Puerta del Mirador, a door towards the sea created by architect Guillen Sagrera, and, in the interior, the chapels Capilla Real and Capilla de la Trinidad, as well as the museum with masterworks specially of the Baroque epoch. La Almudaina - The "Royal Palace", constructed over the rests of the Muslim Alcazar, was the residence of the early kings. La Lonja - Perhaps one of the most outstanding examples of Gothic civil architecture in all the Mediterranean area, with a great facade and fantastic interior. It was built by Guillem Sagrera and is used today as Museum of Arts. Consulado del Mar - Close to "La Lonja", with an outstanding Renaissance gallery of 17th century. Today this building is the seat of the autonomous government. Paseo del Borne - The heart of the historical centre, and one of the most lively streets in town. At both sides narrow medieval lanes as well as elegant palaces of 19th century flank it. The Italian influence, very characteristically for Mallorca in general, is remarkably evident here. Between Cathedral and Plaza de Cort - Here you will find several great palaces, as the ones of Colom, Villalonga, Oleo, Truyols, Oleza, the Archiepiscopal Palais, the church Iglesia de San Francisco and the Arabian Baths, one of very few remains of the Moorish epoch at Mallorca. Plaza de Cort - Here are located the Ayuntamiento, town hall, with its outstanding 17th century facade, and the Gothic church Iglesia de Santa Catalina. El Puig de San Pere - Located behind "La Lonja", this is another old quarter of town that is well worth a visit. Of particular interest are the church Iglesia de Santa Cruz, of 14th century with a 13th century crypt, the Palacio de Montenegro, Casa Weyler and Casa Belloto. Around Plaza Mayor - La Rambla and Avenida de Jaime III are two important shopping streets with beautiful buildings, as Casa Berga (today the province's court of law) with its impressive Baroque balcony. Calle del Sindicato was the seat of the medieval committees. Castillo de Bellver - A fortress located on top of a hill close to the historical centre, built by Peré Salvá during the Gothic epoch. Its elegant appearance almost makes forget that it was originally constructed to defend Mallorca's inhabitants from their enemies. In its interior there is a museum with a valuable collection of pieces of classical antiquity.